The launch Party for Windows 7 took place at the Jávea Computer Club Thursday 22nd October with a presentation by Peter Baylis, this was followed by The Windows 7 launch day raffle which raised 500 Euros for Javea's Alzheimer's Day Care Centre, which will be opening in the Convent near the Old Man's Roundabout shortly. The top prize for the raffle was Windows 7 Home Edition kindly donated by Vic Tattersall. This was won by Peter Way. The second prize was an 8GB memory stick donated by Marc of Eurocartridge, third prize a gift box of shortbread biscuits donated by Xabia al Dia Magazine, and there were also runners up prizes of seven Windows 7 re-usable gift bags. Our thanks to all the prize contributors and the girls at the cash desk who did so well in selling the raffle tickets. This brings the total raised by the Club for the Alzheimers centre since June this year to over 730 Euros. 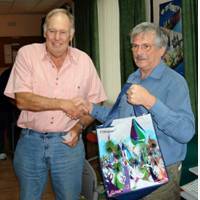 Our photograph shows Committee Member Vic Tattersall presenting club member Peter Way with his Windows 7 operating system disk as first prize including the bag, runner up was Andreas Wernli winning the 8 gigabyte memory stick.